As an undergraduate at the University of Arizona, Kristy vanMarle knew she wanted to go to grad school for psychology, but wasn't sure what lab to join. Then, she saw a flyer: Did you know that babies can count? "I thought, No way. Babies probably can't count, and they certainly don't count the way that we do," she says. But the seed was planted, and vanMarle started down her path of study. The person who made that flyer, Karen Wynn, became her mentor and they have since co-published several studies together. I spoke with vanMarle, an associate professor at the University of Missouri whose research focuses on children's early cognitive development, to find out what she's been up to lately. The interview that follows has been edited and condensed. So, what's all this about being born mathematicians? In my lab, we are particularly interested in numerical development and understanding of objects — how the early number skills of young infants, possibly even newborns, get built upon to develop a uniquely human capacity for symbolic math. The roots of those abilities and those skills seem to come from an endowment that is evolutionarily ancient and that we share with most other species. In other words, we've evolved to know math — along with almost every other animal. How did you become interested in this? I've always been fascinated with the idea that you can have this sophisticated knowledge — at least the foundations of it — in place, very early on. And we know now that it's very broadly available across animal species. Species as different from humans as fish: Guppies are sensitive to numbers in the environment. Of course, primates are. Salamanders. Various insects. It's this basic ability that helps animals navigate their environment. I mean, literally, navigate the environment by calculating angles and distances and so forth. It helps them choose the greater amount of food if they're choosing between two quantities. It shows up in foraging contexts all the time. So I've gotten interested in how these early abilities might provide a foundation for these much more sophisticated abilities that humans grasp pretty ubiquitously. If you're exposed to math and counting, all humans will get it to a degree. Some more easily than others, of course, we all experience that. But the capacity is certainly available. What's been the focus of your most recent research? Being literate with numbers and math is becoming increasingly important in modern society — perhaps even more important than literacy, which was the focus of a lot of educational initiatives for so many years. We know now that numeracy at the end of high school is a really strong and important predictor of an individual's economic and occupational success. We also know from many, many different studies — including those conducted by my MU colleague, David Geary — that kids who start school behind their peers in math tend to stay behind. And the gap widens over the course of their schooling. Our project is trying to get at what early predictors we can uncover that will tell us who might be at risk for being behind their peers when they enter kindergarten. We're taking what we know and going back a couple steps to see if we can identify kids at risk in the hopes of creating some interventions that can catch them up before school entry and put them on a much more positive path. How exactly do you study something like that? We followed kids through two years of preschool and assessed a really broad range of quantitative skills. Because when you talk about math achievement and number knowledge, it's not a single solitary construct. Over the two years of preschool, we gave them 12 different tasks — twice a year. Some were symbolic: being able to recite the Arabic numerals or the verbal count list. Others were tapping these earlier, emerging non-symbolic skills: being able to estimate which of two sets of dots is bigger, being able to keep track of additions and subtractions that happen in the environment. Skills like that are building on these evolutionarily ancient core capacities. So which of those actually predict math achievement? Out of those 12 different skills, there's really one or two that matter most. When we followed up with these kids in kindergarten and first grade, their ability to estimate quantities — this ancient ability — seems to be really important. And also their ability to engage in cardinal reasoning i.e. knowing that the number three — when you see it on a page or hear someone say "three" — that it means exactly three, which is really at the root of our ability to count. This cardinality, in particular, seems to be the most important skill that we can measure at a very young age and then predict whether kids are going to be succeeding in a much broader assessment of math achievement when they enter kindergarten. Will this have an effect on what kids learn in preschool? Well, we hope so. If you look at preschool curricula — kids who are getting structured instruction in math early on — it's really trying to tap these different skills. But when you have a lot of different things you're trying to teach, you don't go into depth with them, right? You're just trying to touch on all of them at once. Our research points to the possibility that it might be more effective for early education if you focus on these core skills that seem to matter the most for developing symbolic knowledge. We're currently running a pilot study — an intervention that targets this ability. What does that intervention look like? Children count and create sets. We use ice cube trays to count some number of objects. We say, 'Can you put six items into this tray?' And then we point out very interactively where they make mistakes and try to reinforce rules. It's too early to say. We are currently inputting the data and analyzing it so I don't have the punchline for you, unfortunately. But we're hopeful it will be effective. It's the kind of thing that parents and early educators can engage in with children. It's possible to even create an app that would allow kids to make sets on an iPad. Of course, that's way down the road for us. But that's kind of where we're headed — getting an intervention that works. We know how to identify which kids are likely to be at risk so the logical next step is to figure out a way to help them. Your research points out that parents aren't engaging their kids in number-learning nearly enough at home. What should parents be doing? 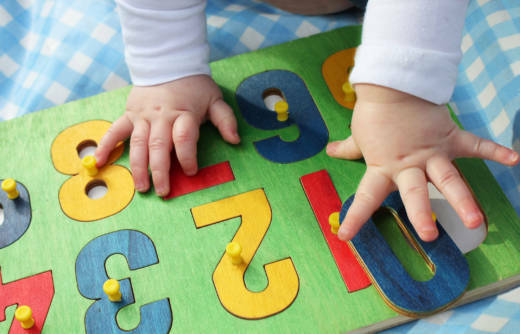 There are any number of opportunities (no pun intended) to point out numbers to your toddler. When you hand them two crackers, you can place them on the table, count them ("one, two!" "two cookies!") as they watch. That simple interaction reinforces two of the most important rules of counting — one-to-one correspondence (labeling each item exactly once, maybe pointing as you do) and cardinality (in this case, repeating the last number to signify it stands for the total number in the set). Parents can also engage children by asking them to judge the ordinality of numbers: "I have two crackers and you have three! Who has more, you or me?" Cooking is another common activity where children can get exposed to amounts and the relationships between amounts. I think everyday situations present parents with lots of opportunities to help children learn the meanings of numbers and the relationships between the numbers.